You know what I don’t like about automated tests? Most of the time, we don’t automate them, we just instrument them. We write our tests and then open a console window to run them periodically. Maybe we set up a watcher to automatically rerun them when either a test or the code file changes, and maybe we use an integrated console window in our editor to monitor when things change. While there is nothing wrong with this approach, I find it to be frustratingly inefficient and distracting. I want to keep working and just be notified with a subtle visual indicator that’s akin to someone who is watching me work and subtly taps me on the shoulder when something is wrong. Thankfully in the testing world, a solution exists! In this post, I am going to show you what I use and how I configure my SharePoint Framework projects to continuously run my unit tests efficiently and minimize distractions so I can focus on the task at hand. Wallaby.js isn’t a free product; it requires a personal or company license. There is a trial period you can take advantage of to see if it works for you. From my POV, it’s cheap for what I get in return, but that’s up to you. I’m not getting anything for this post, the guys at Wallaby.js are getting some free marketing out of this as I have my own license that I purchased… in fact, I’ve purchased it twice: the initial one and a renewal after the first year of free updates. What’s so special about Wallaby.js? Instead of having to open a console window to see the results of your tests, it decorates your editor with the information it collects so you can keep your eyes on the task at hand. From the above image, you can not only see the tests are passing but if you look at the end of line #11, you’ll see this test took only 3ms to run. Notice how the actual error message that you would see in the console is added to the right of the failing test. The lighter red or pink indicator is showing a line that is failing, but only because it’s in the test that’s failing. In the previous figure, you can see line #3 in the add() method is triggering a failing test. All these subtle indicators will change (if necessary) each time the tests are executed. No more switching focus to some console window watching for the results of your tests! If you want to see the console, you can open the integrated console up in VSCode, change to the Wallaby.js Tests window and you can see the raw results. You can even see the status of your entire application’s test suites in the status bar of VSCode at the bottom. In the image above notice, the highlighted area that shows 100% code coverage and 10 of the 11 tests across my entire application are passing while 1 is failing. If I click the test in the console window above, VSCode will jump to the failing test within my app. Here I can see all my tests, their status and click on them to see the results in the right panel or click one of the icons in the tree view to have the app open the file in VSCode. I don’t use the web app much, but it is helpful with getting an all up view of my project’s overall health. You can check out the Wallaby.js site to learn more and how to configure it. What follows is what you need to do for a SharePoint Framework (SPFx) project. After installing the VSCode extension, the next step is to create a configuration file for Wallaby.js. This tells Wallaby.js what files it needs for the tests to run, the test files and a bunch of other stuff. Some of these are needed, such as the setup function, because I’m using Jest as my test runner & because I put its configuration file in the config folder. Check the Wallaby.js documentation for details on all the options I’m using. files: An array of all files that Wallaby.js will need to run my tests including the TypeScript project file tsconfig.json and the Jest configuration file. Note that I’m specifically excluding tests and a *.scss.ts file, generated by the SPFx build engine, from the collection as they will just hurt my code coverage percentage. *Notice how some are just strings while others are objects? 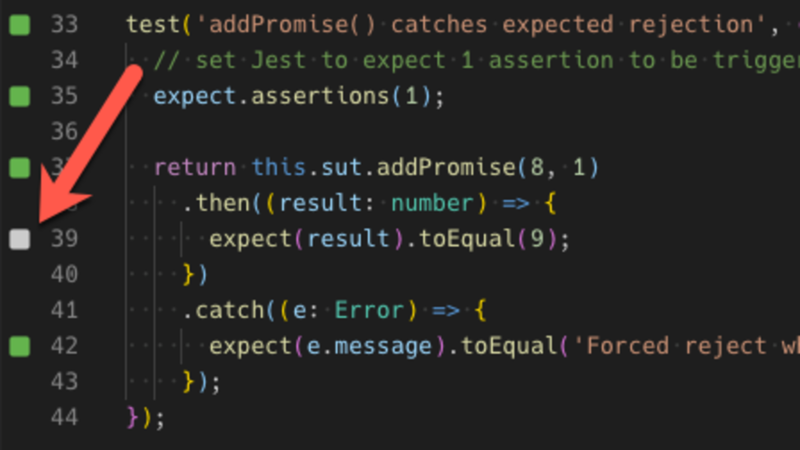 The object approach enables me to tell Wallaby.js I don’t want this file included in code coverage calculations (ie: instrumentation: false). hints: Includes a regular expression for strings that should tell the Wallaby.js code coverage analysis what strings indicate the following line should be ignored. I’m usually using Istanbul as that’s what Jest uses so I’m just telling Wallaby.js to use the same string. compilers: Because SPFx projects already have a tsconfig.json file that configures the TypeScript compiler to use esnext as it’s module resolution. Live is simpler if you configure Jest for commonjs as it’s just a Node.js app. That’s what I’m doing in the compilers section. That’s it… just run it by either selecting the Wallaby.js: Start command from the VSCode Command Pallet. Enzyme is a renderer for Jest by Airbnb that replaces what we get out-of-the-box from Jest. If you are using it in your React tests, you have a bit more configuration. In addition, your Wallaby.js config needs a bit more work as well. After adding the Enzyme setup file to configure the React version specific render to the files collection, I updated the setup function. Because files are moved around, the value of <rootDir> in the Jest config file gets a little wonky. Therefore, I just change the properties in the Jest configuration file to work with Wallaby.js.